Chances are you also add different margins depending on the image, but you tend to add the same set of margins over and over. 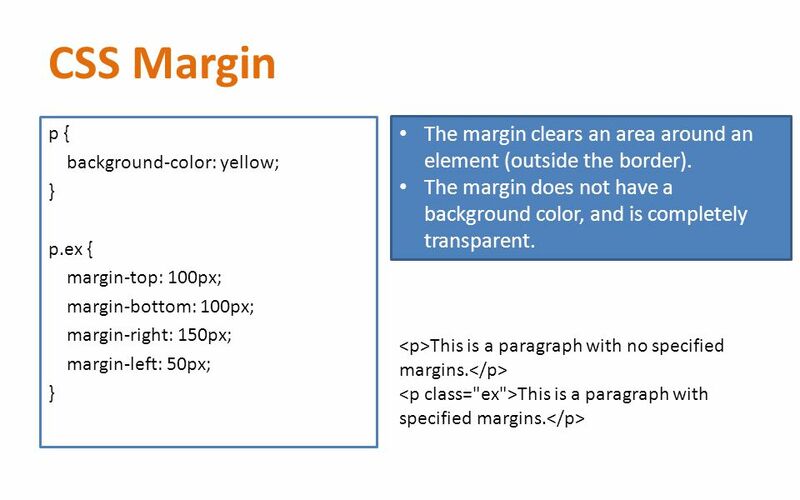 In that case you create a new CSS rule for each of your margin scenarios and apply them as necessary the same way we applied the border.... Chances are you also add different margins depending on the image, but you tend to add the same set of margins over and over. In that case you create a new CSS rule for each of your margin scenarios and apply them as necessary the same way we applied the border. Chances are you also add different margins depending on the image, but you tend to add the same set of margins over and over. In that case you create a new CSS rule for each of your margin scenarios and apply them as necessary the same way we applied the border. I have searched for an answer but couldn't find it anywhere. My question is reasonably simple: I have a background color of my body, then a large margin, and now I want a different background color inside the margin.